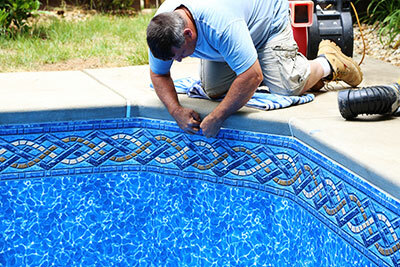 Pool liner replacements are our specialty. With thousands of in-ground pool liners installed in over thirty years, we know how to get the job done. We use only the hightest quality products in the industry, and most of them are made right here in North Georgia! If you are in the Atlanta area or North Georga, call us today to schedule a FREE poolside quote, where our experts will evaluate your pool and help you select the product that best suits your needs. When you choose Paradise Pool Services, you will only receive a liner that has been custom manufactured to fit your pool. While there are many standard pool shapes and sizes that allow for mass produced "in-the-box" liners, we believe that in order to get the best performance and longest life for your liner, it needs to be custom fitted to your pool. When pool liners are folded and stored for a period of time, the area of the folds can weaken, and the liners are harder to flatten out for installation. Also, prolonged warehouse storage and long shipping journeys can introduce vinyl pool liners to heat, moisture, and potential for mold. That is another reason why Paradise Pool Services only installs custom made pool liners tailored to fit your pool. 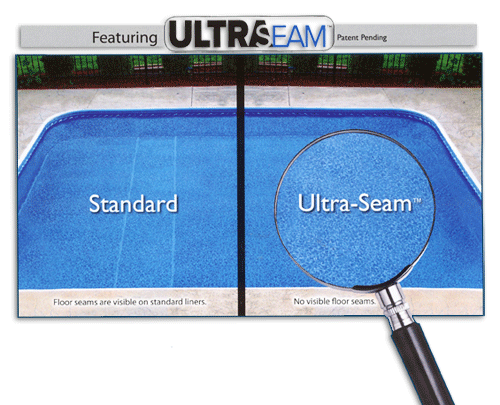 Standard pool liners present visible lines on the pool floor at the seams which ultimately distract from the beauty of the pool. KAFKO's innovative Ultraseam technology elevates their liners to an entirely new category. This exclusive process makes floor seams stronger and virtually invisible, so there's nothing that gets in the way of the picture-perfect beauty of your pool!